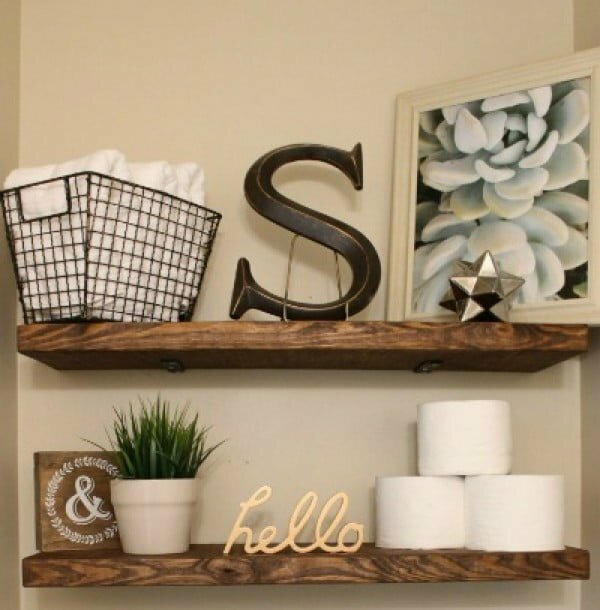 Double, triple, or quadruple your bathroom storage space with stylish DIY bathroom shelves. Its the ultimate solution that is all the rage right now. 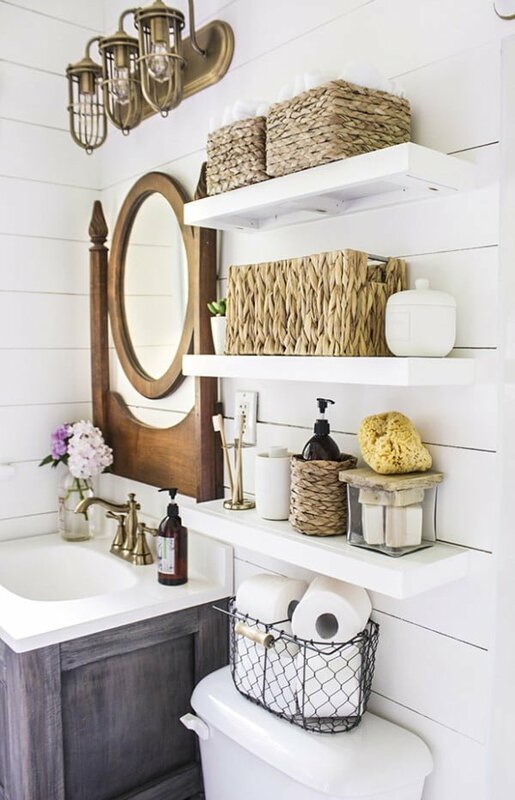 What if we told you that you could solve all your bathroom storage problems and revamp your bathroom decor, all in one easy DIY project? That’s exactly what is our new selection of DIY bathroom shelf ideas is all about. You’ll be able to increase storage space no matter how small your bathroom is. So don’t hesitate, check out these 30 brilliant ideas with tutorials and dust off your tools. You’re about to build something awesome! 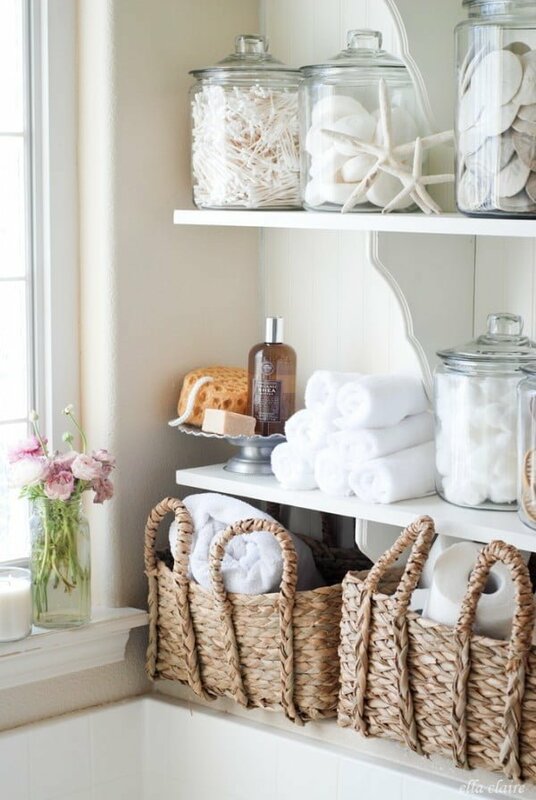 Add storage to your bathroom with these easy to make bathroom storage shelves. 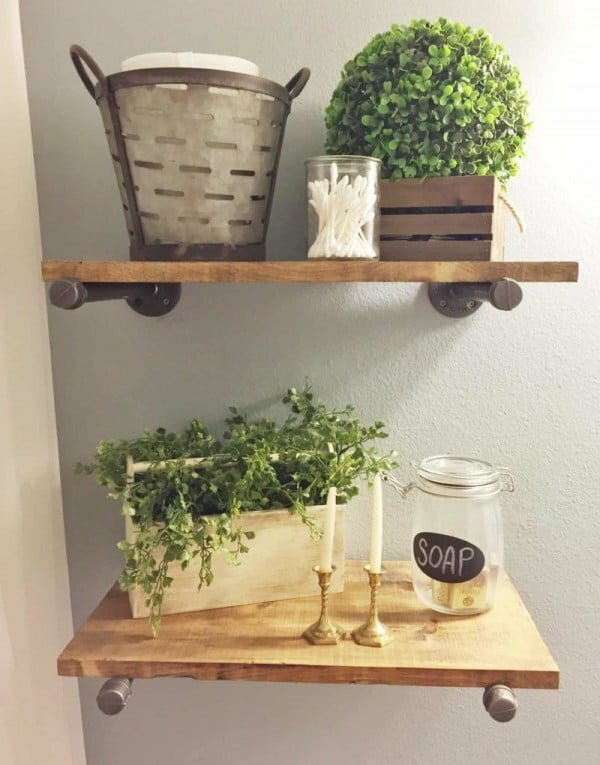 This over toilet shelf is full of farmhouse charm with beautiful details. See this website to see the comprehensive plans. Gain extra storage inside the walls. 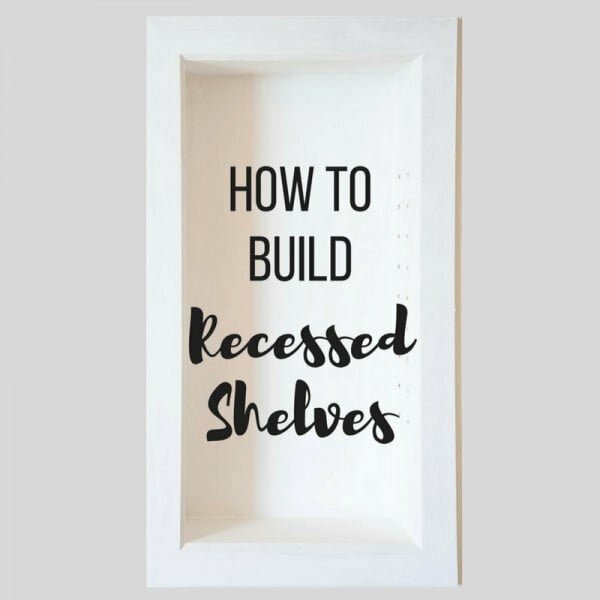 This tutorial will show you how to build recessed bathroom shelves or a wall niche between the studs. See this website to find out how to do it. Learn how to Build these Easy DIY Industrial Pipe Shelves. Complete with instructions this tutorial will guide you through the steps to build these shelves. See this website to find out how to do it. 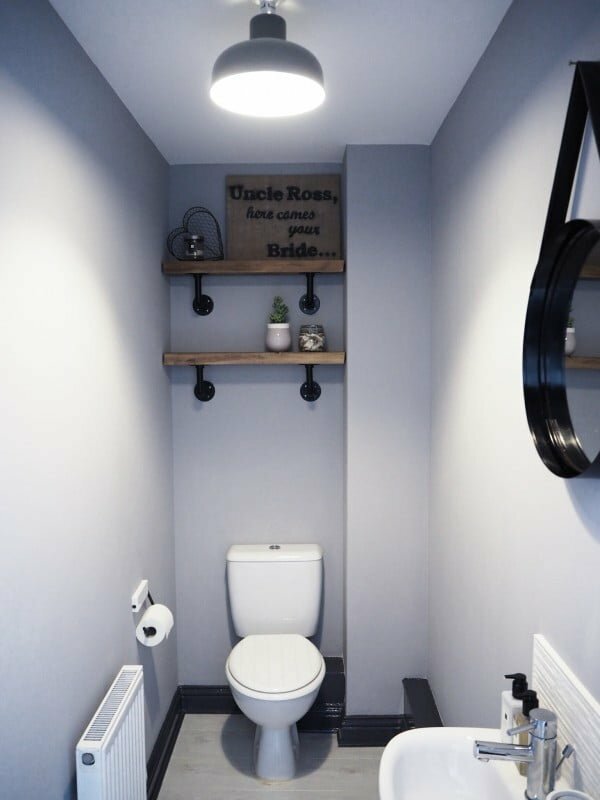 If you need some extra bathroom storage in your small bathroom these bathroom floating shelves above your toilet will solve your storage issues. Check out this website to get the complete details and instructions. 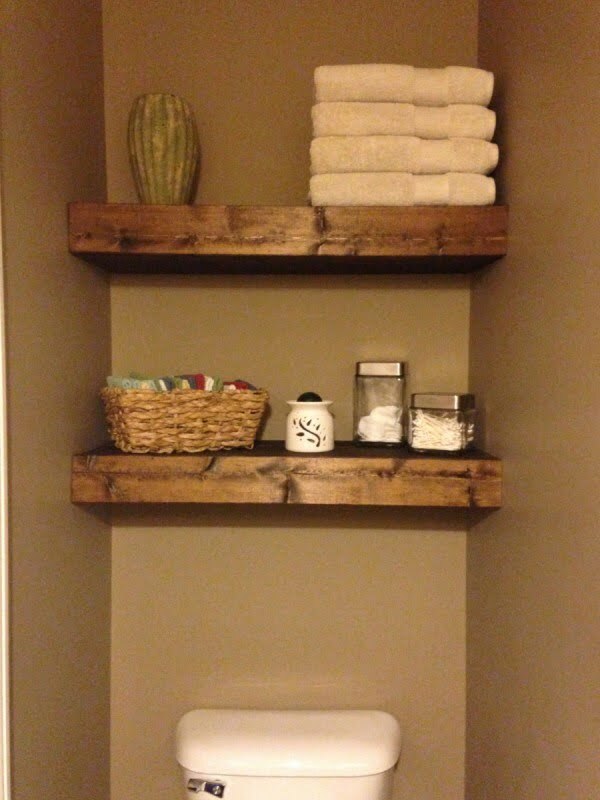 This is a terrific project idea for DIY rustic bathroom shelves on a budget. Follow the link to find out how to do it. 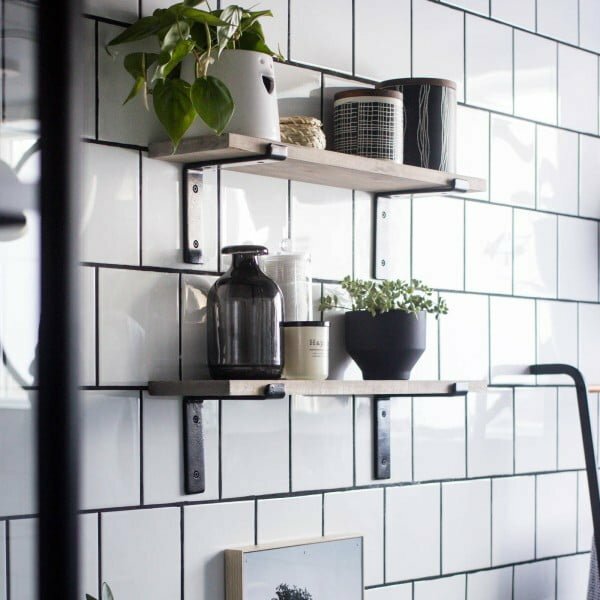 Make this tremendous DIY industrial pipe shelving solution as an easy project idea. Follow this website to see the entire details and instructions. 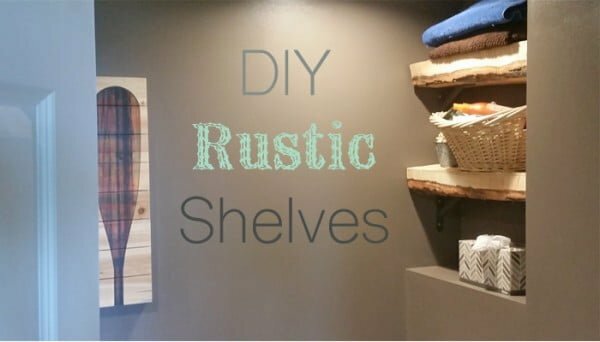 This is an excellent project of recycled pallet wood DIY floating bathroom shelves. Check out this website to find out how to do it. Build a DIY floating ladder shelf with this step by step tutorial, plans, and video. 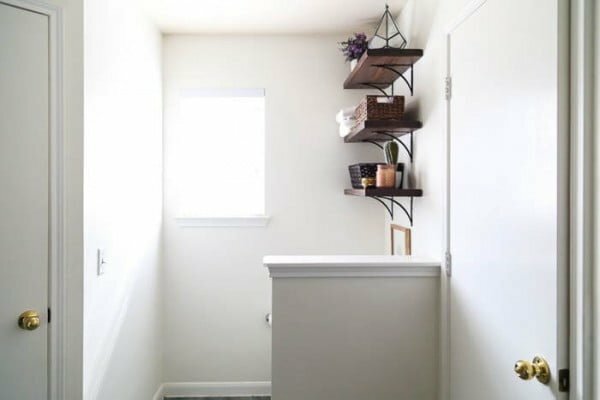 Build a unique combination of DIY ladder shelf and DIY floating shelf. Follow the tutorial to learn how it’s done. 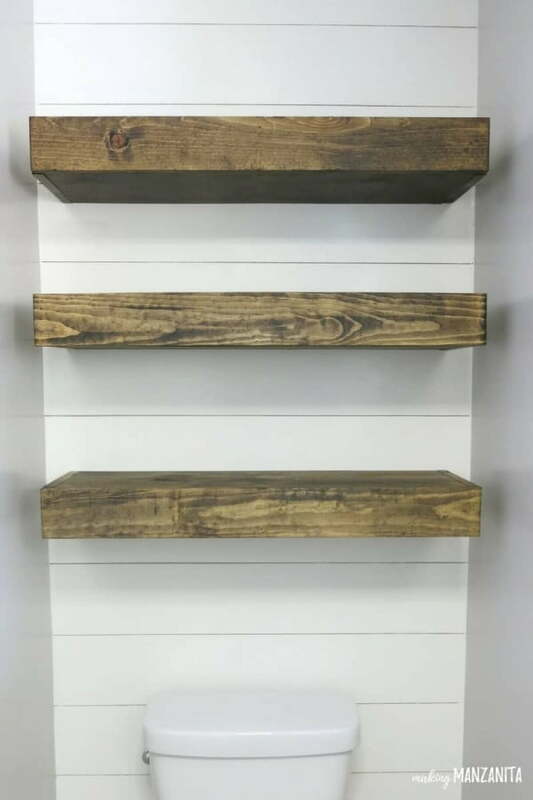 Easy and cheap DIY Faux Floating Shelves. 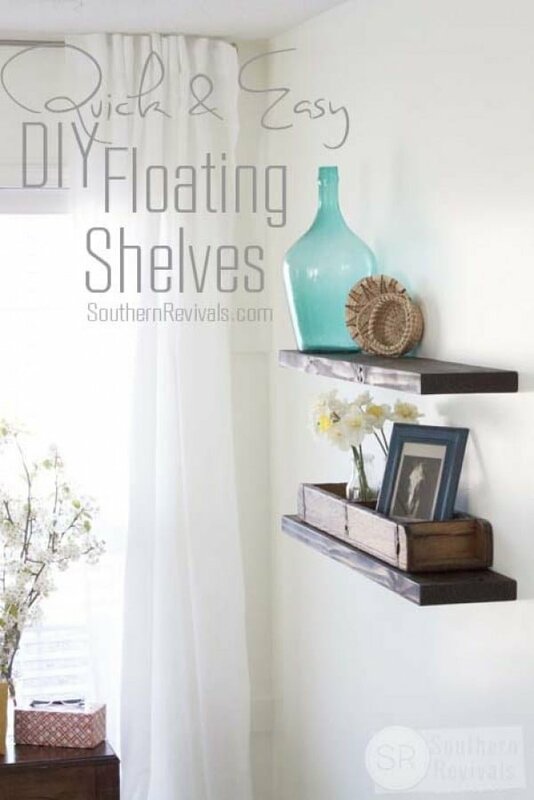 Finally, you can have the look of floating shelves with so much less work. Follow this website for the complete plans and instructions. 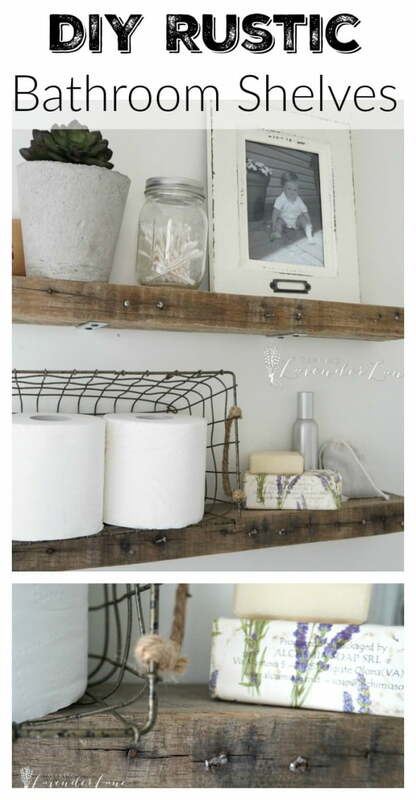 Create these amazing chunky DIY rustic bathroom shelves for a straightforward craft project. Check out this website to find out how to do it. 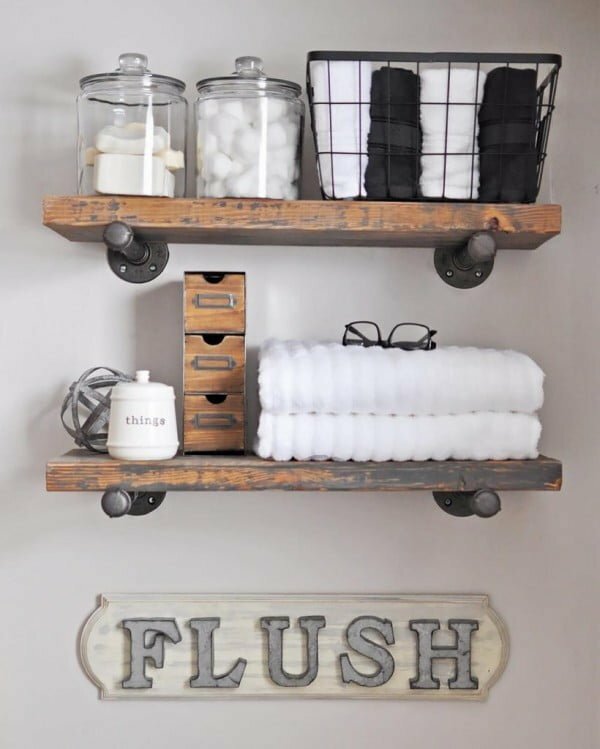 Build the DIY industrial shelves for the bathroom you can recreate the easy way. Follow this website for the entire plans and instructions. These drop-down cabinets look great in any bathroom and are perfect for small spaces. Make them yourself from the cabinets you already have. Follow the link to see how to do it. Need some custom shelves for a small spot in your home? 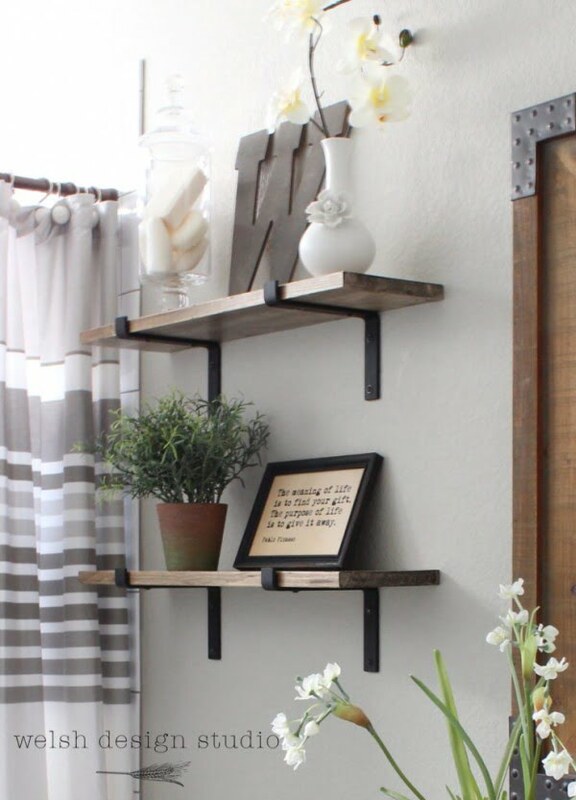 These DIY floating shelves are perfect for any nook in your home. Read the link to see how to do it. Super easy step by step tutorial for how to make DIY industrial pipe shelves. 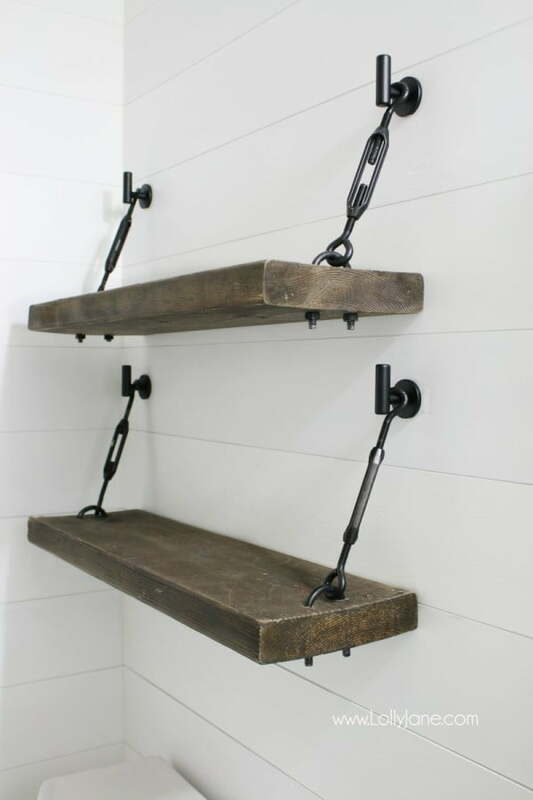 Industrial pipe shelving is excellent in both industrial and farmhouse home decor. Check out the tutorial for the full details and instructions. 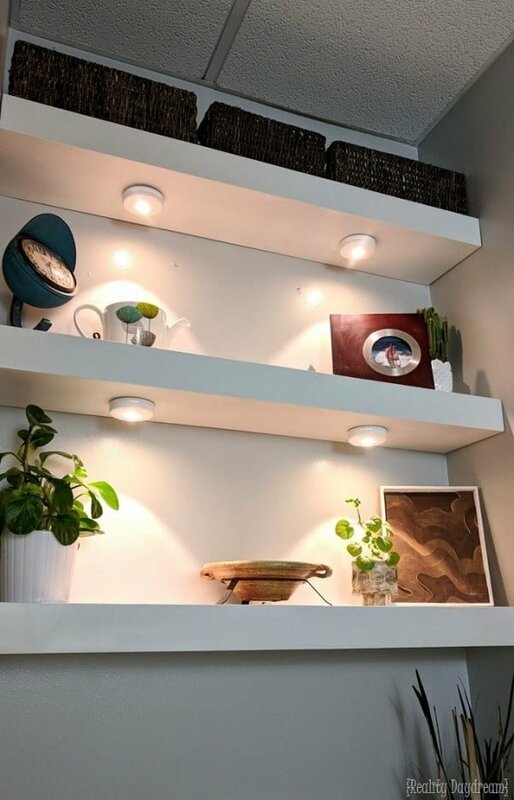 Easy and budget-friendly DIY Floating Shelves tutorial – no cleats, no building and no special woodworking skill required. See the link for the entire plans and instructions. 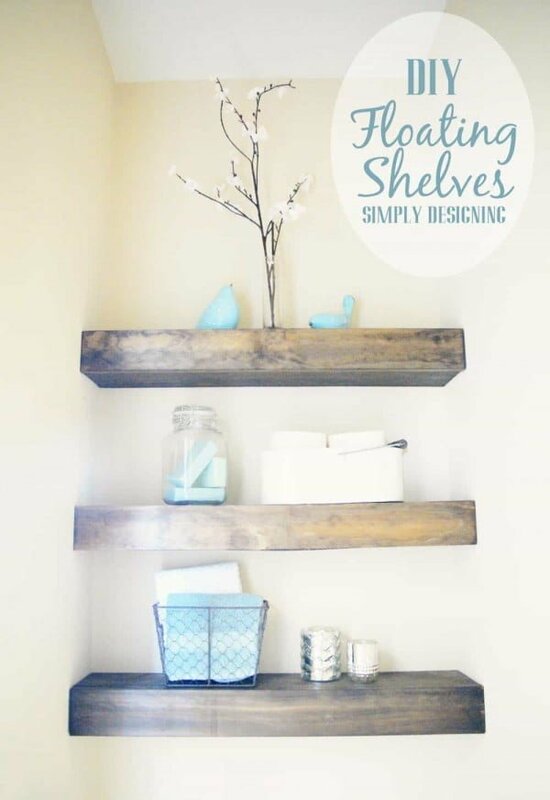 DIY Floating Shelves are easy to make! And they are the perfect shelves to build in small or narrow spaces in your home. Check out this website for complete guidance and instructions. 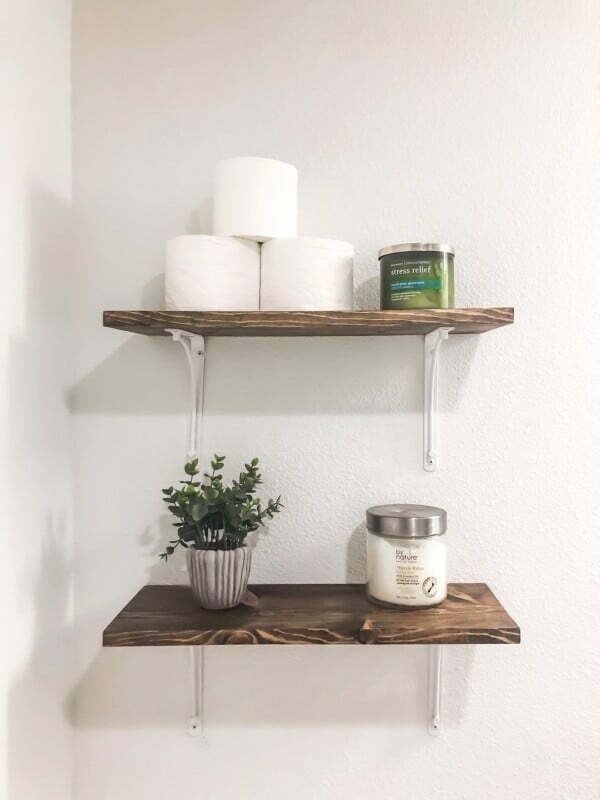 Build these great DIY bathroom shelves using this tutorial on a budget. Read the link to see the complete details. 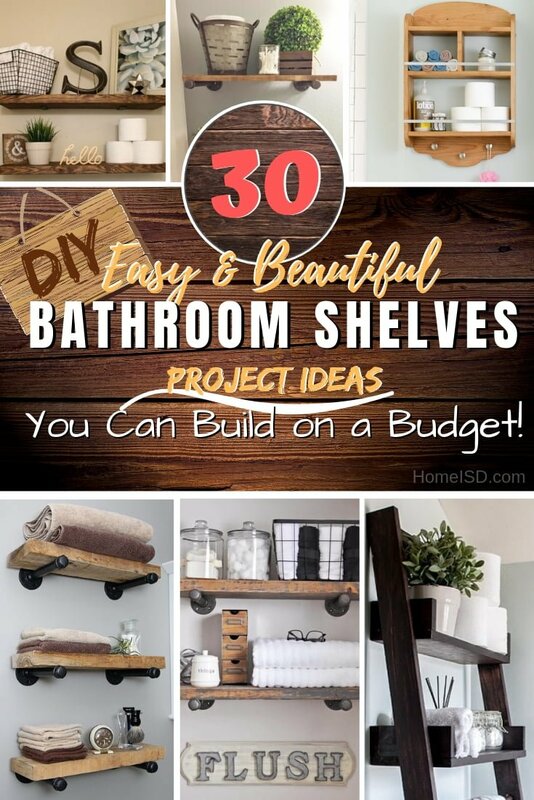 This is a terrific DIY bathroom shelves project on a budget. Check out this website to find out how to do it. Build the DIY bathroom shelves over the toilet the easy way. Read the article to learn how it’s done. 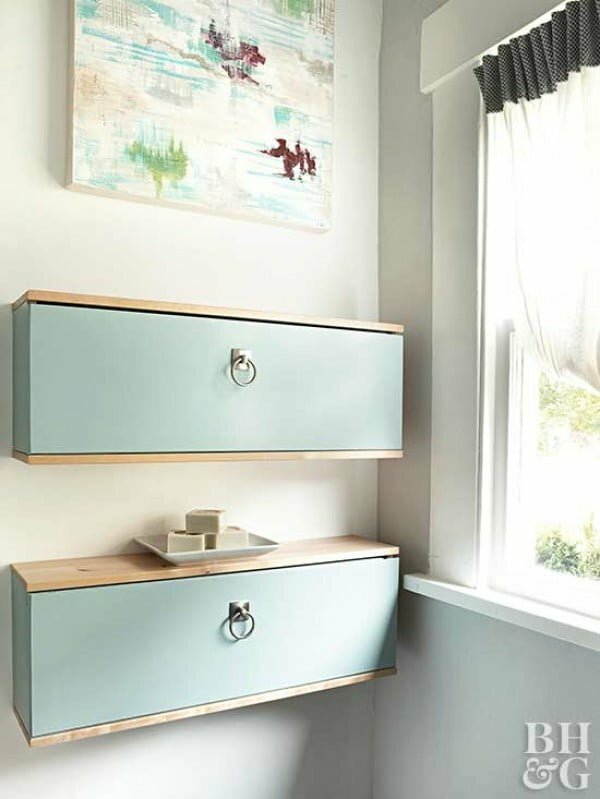 This is a beautiful DIY project for a quick turnbuckle shelf on a budget. Check out the article to see how it’s done. How to make narrow floating shelves perfect for a bathroom above a toilet and for around $20 you can make a set of 3. Customize with paint or stain. Follow the article to see how to do it. 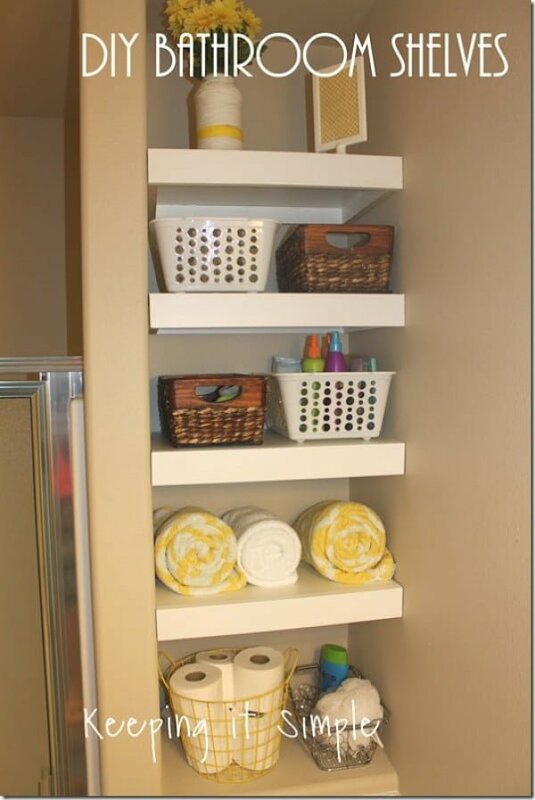 Storage Solution for Small Bathrooms – DIY Bathroom Shelves. Check out the link to find out how it’s done. 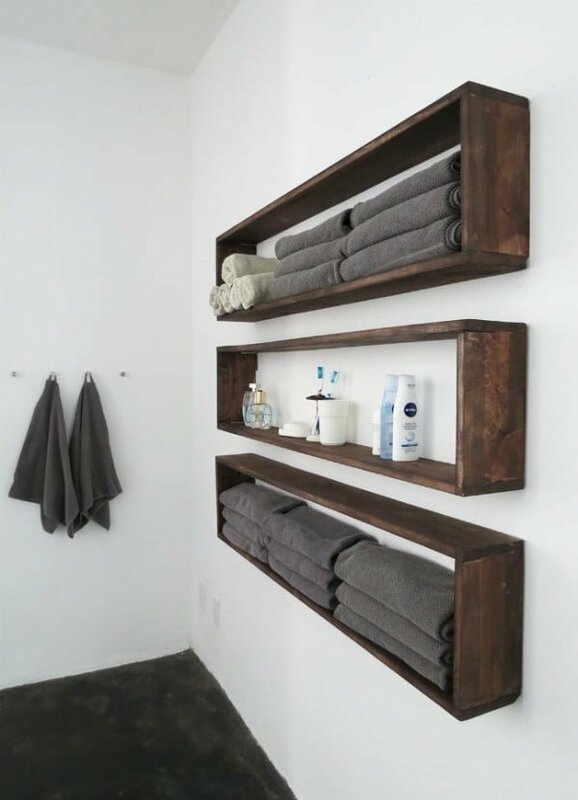 Learn how to build some simple bathroom shelving. 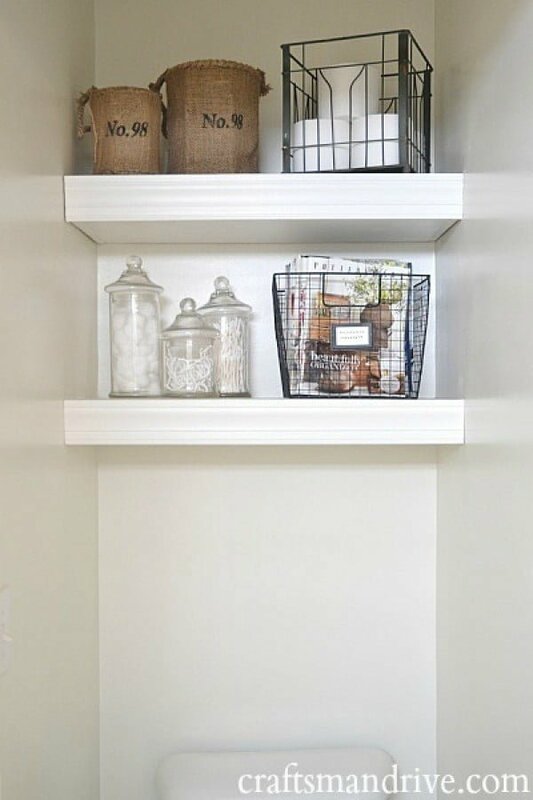 The open shelving is beautiful and so easy to make. Get tips and tricks for drilling into tile too. See this website to see the full details. 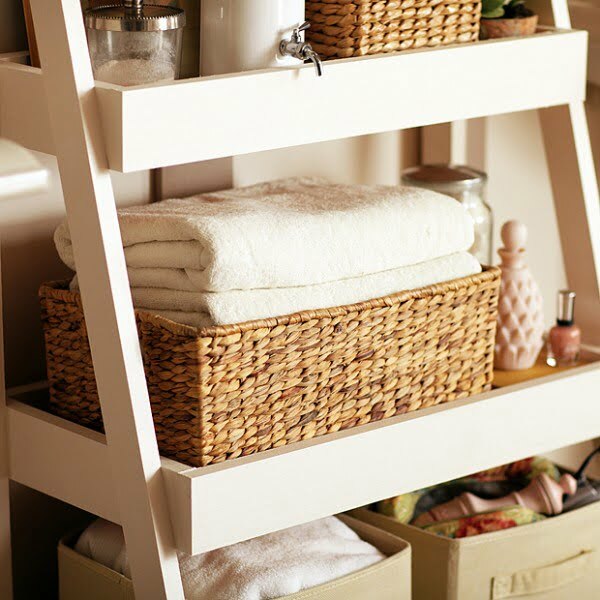 Make this fantastic DIY bathroom linen shelves for a straightforward craft project. They will work as a decor display too. See the article to learn how it’s done. 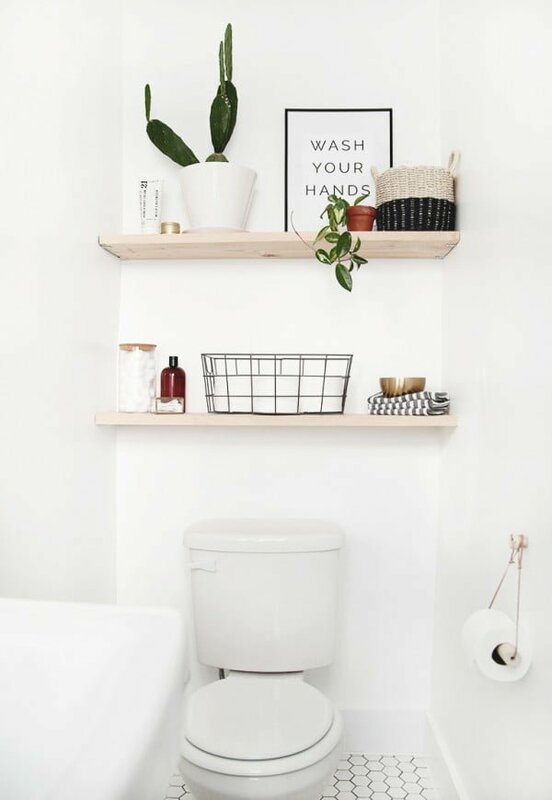 Make these simple DIY bathroom shelves above the toilet the easy way. See the link to learn how to do it. Floating shelves are a look to enjoy; it’s clean and practically seamless. Install DIY bathroom floating shelves on a budget. Follow the tutorial to see how it’s done. 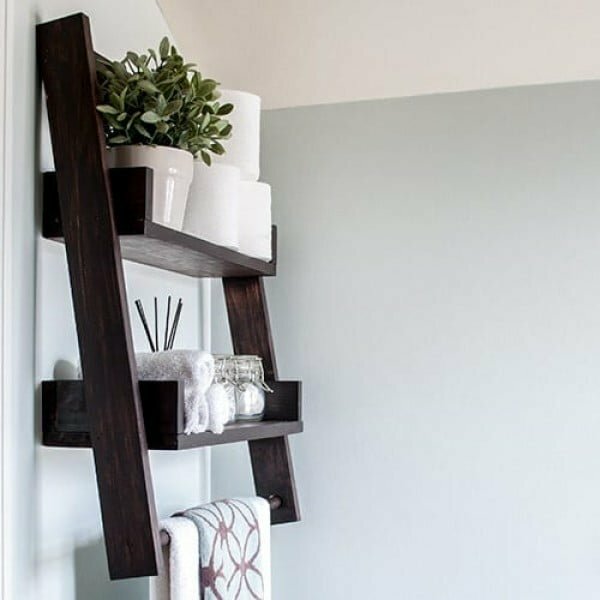 These simple bathroom shelves are easy to install, but the result is stunning. Replace your ugly cabinetry with some pretty open shelves. Read the article to get the full details. 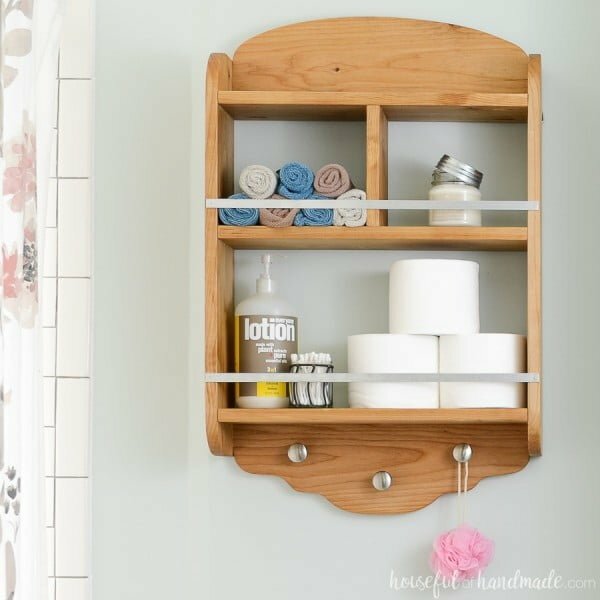 These beautiful DIY bathroom storage shelves provide plenty of space for towels, soap, cosmetics and more. See the tutorial to see the entire details. 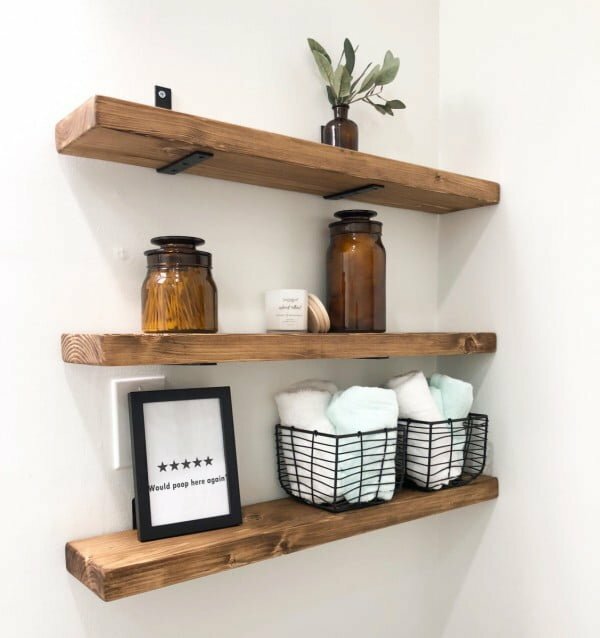 Build and mount this simple set of wooden wall shelves to easily double (if not triple) the existing storage in your bathroom. Read this website to see the full plans. 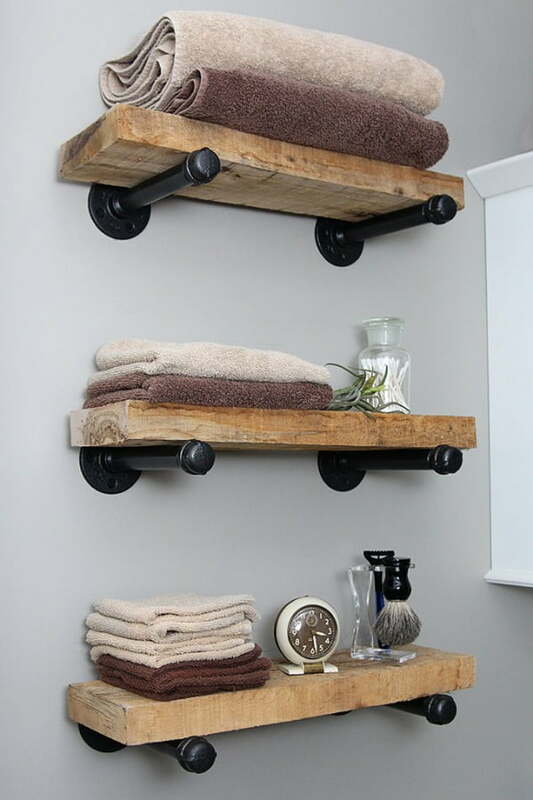 Wooden crates make great shelves that you can hang on the walls in your bathroom for the perfect towel rack. Not only it’s useful, but the unit also gives your decor a rustic accent with a lot of character. Follow the tutorial to build it at home.